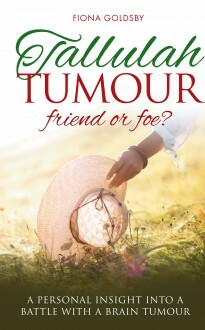 Our self-published books: Tallulah Tumour: friend or foe? Tallulah Tumour: friend or foe? Fiona Goldsby has emerged triumphant from the terrifying experience of suffering a serious brain tumour. She found very little written material was available to help her in her battle, so she has written Tallulah Tumour, friend or foe? to help others dealing with a similar diagnosis. It is intended to provide information about what the patient may expect, with hints and tips to deal with the various side effects. The information in the book will not only be helpful to patients but to caregivers and family members. And as you may guess from the title, there is plenty of humour as well.